What a great way to familiarize yourself with the letter Nn. 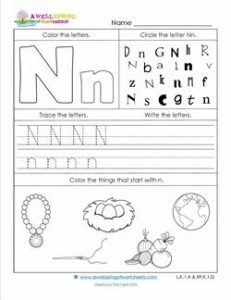 On these abc worksheets, including this one, kids can color the uppercase and lowercase N, circle the N’s in different fonts, trace and write the letter N and identify the objects that begin with n. It’s a great exercise to interact with the letter n in different ways. After all, that’s how things are in life – everything does not always look the same.